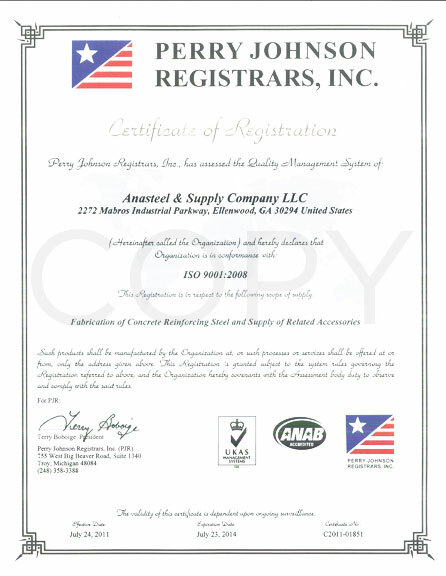 Anasteel & Supply Co. LLC joins more than 1 million companies worldwide and 30,000 in the United States that have achieved ISO 9001: 2008 certification of their QMS (Quality Management System). This certification provides Anasteel customers with assurance that our QMS conforms to the requirements of the ISO 9001: 2008 quality management standard. Conformance to this international quality standard requires that our QMS is monitored, reviewed, and improved on a continual basis. This process means that Anasteel & Supply Co. will meet your needs now and in the future. Anasteel’s dedicated quality assurance staff ensures that products fabricated at our Ellenwood facility meet or exceed our customer’s requirements and that all staff members from top management to shop personnel are active participants in fostering a culture of continual improvement.